It may be necessary for the developers to test their Windows Phone apps on not just on the Windows Phone emulator but also on the actual Windows Phone device . Although the emulator provides almost all the functionalities for testing the app , app testing on the real device , the developer can be more confident on how the app works in real time. To unlock your Windows Phone 8 for developing and deploying apps on the Windows Phone 8 device, you need the following. 1. Windows Phone 8 SDK installed. 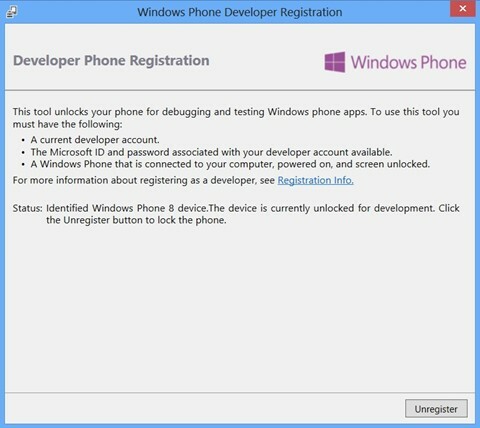 Make sure that your Windows Phone 8’s screen is unlocked and is connected to your Windows 8 PC when registering the Phone for development. You can register your Windows Phone by using the Windows Phone Developer Registration Tool that is part of the Windows Phone 8 SDK.